If you live in a “cold country” you may wonder if aquaponics is possible. It is a very legitimate question as when we talk about aquaponics we often talk about tropical fish such as tilapia and barramundi. We know for fact that aquaponics is giving good results in warm countries but what about cold water aquaponics? The fish and plant population will need to be adapted to those temperatures. We will obviously not be able to grow tropical fish in those conditions. Generally the temperature can fall close to 0oC in winter so the fish need to be very well adapted in order to survive to those condition. Trout is an excellent candidate to cold water aquaponics as they are considered as a cold water fish. Other fish such as carps and red fin are also able to survive in those extreme condition. An easy way to qualify adapted fish is to find out what type of species are naturally growing in the local rivers, lacks and dams. Another option is to see if there is an existing fish farm around and to go and see what type of fish they are growing. You can also ask if there is a possibility to buy fish fingerlings (baby fish). The bacteria metabolism is dependent on the water temperature. In cold water the bacteria are a bit slower and are not going to be as efficient as in warm temperature condition. The biomass (quantity) of bacteria necessary to transform the ammonia into nitrate will be higher. The cycling process (time necessary for the bacteria to colonize the media at the start a new ecosystem) will also take longer than in warm water. The risk in cold water aquaponics is to have the water that freeze in winter and to damage the equipment (pipes, tanks, pump) and to lose the fish. Different options will allow you to avoid or minimize those problems. The first of them is to cover the tank during the night to insulate the water from the cold. If you know that the water will freeze you can use swimming pool floats to protect the tank. Those floats will actually absorb the pressure coming from the ice and avoid the tanks to break. I highly recommend it. If you leave in a country where the air temperature drops below minus 20oC I highly recommend to insulate the tank with materials such as polystyrene sheets or even to dig your fish tank inground. The aim is to keep the lowest water layers warmer even if the surface is frozen. When you know that the water will freeze during winter it is important to remove the pump and pipes. It will avoid this equipment to be damaged. If you have a low fish density they will be able to survive through winter even if the top of the pond is frozen as long as the bottom of the tank is still liquid. It is obvious that we will stop feeding the fish in those conditions. 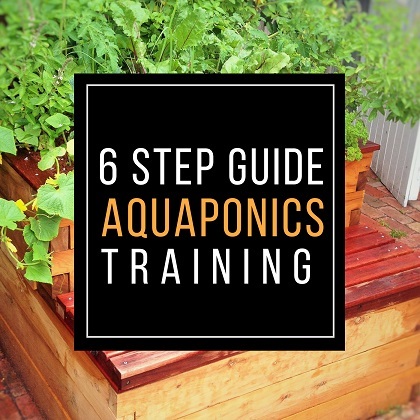 If you have the budget, the best option is to place your aquaponics system into a greenhouse. It will extend the productive season and there are some ways to heat the water in order to stay productive the whole year round. It is possible to use a solar heating systems to heat the greenhouse. There are different types of solar heating options but the most efficient options are generally costly. Another technique that I would recommend is to use a compost heater. In certain condition the compost can heat and generate a significant quantity of energy. It is possible to run the water pipes coming from the water pump inside the compost. This will heat the water for free and allow the system to remain productive even during the coldest months. We developed this topic in details in another post. It is possible to run pipes into the basement of the greenhouse and to circulate the air of the greenhouse into the soil during the day so that the soil will heat. The same process is done during the day and the heat from loaded into the soil during the day will be released during the night and keep the temperature acceptable. It will avoid the drops of temperature during the night. Even if aquaponics is more productive in warm water than cold water, it is still possible to use this technique in cold condition. The system will be more productive during summer but with a greenhouse and a heater (compost heater) it is possible to build a system productive all year around. Aquaponics remains a very interesting option in cold countries as it will always remain more productive as a classic garden placed in the same conditions. With the apparition of new technologies we can imagine a new system with heating and lighting for the coldest months of the year that remain sustainable and ecofriendly :).